February--it doesn't get much better than this! We took a vacation from our extended vacation to spend ten days in mid-February in California for Hunter's first birthday. This picture is a replica of one taken two years ago--before Chase and Hunter were born and here we are with all our children and grand children. 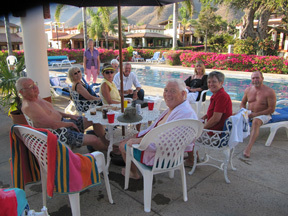 Thanks to Carmen's friends, Cathy and Steve, we got to spend Valentines day with them and enjoy their hot tub. Left to right is Larry, Craig with Clara, Denise with Chase, Glorine, Carmen with Hunter and Mike with Dakota and Sierra. 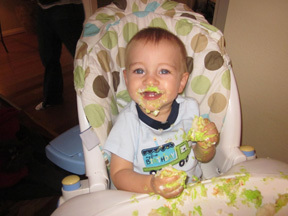 Doesn't Hunter look glad that his first birthday brought the Barnhardt clan together?? 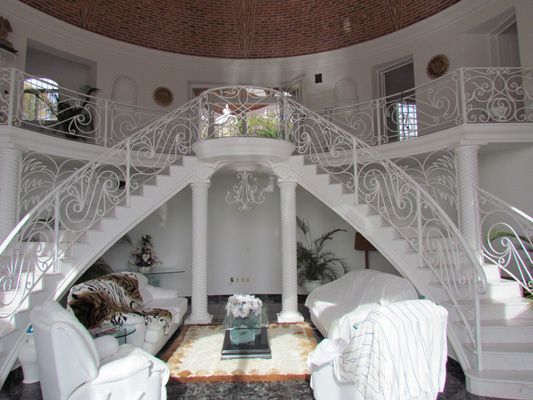 This home is one of the most elegant homes to grace the foothills overlooking Lake Chapala. The owners are in poor health back in the states and a friend of ours was house sitting. He invited us over and gave us a grand tour. At the head of the two winding staircases, is the main entry. It has marble floors, four casitas, a swimming pool, an outdoor kitchen and a spectacular views of the lake and mountains. 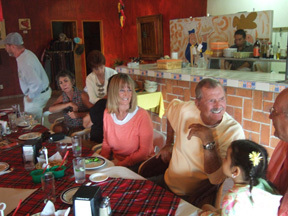 Here with Glorine is one of our friends from Guadalajara, Terrie, who came down to Ajijic on a Sunday to spend the day with us. 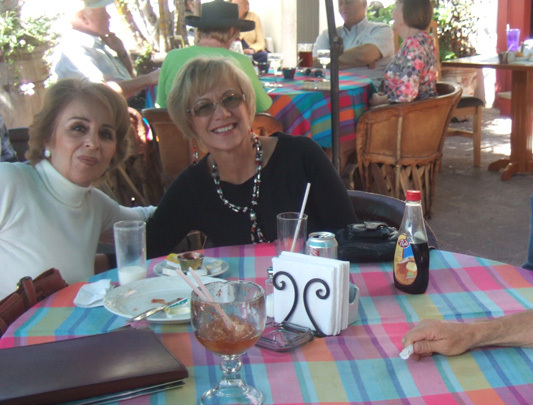 After dinning at an outdoor cafe in the heart of the village, we walked along the lake and stopped in on friends that had met Terrie over the years. Thanks to emails, we have been able to keep in touch even when we are not in Mexico. After another nice day at the spa, a few of us came across this restaurant, which we heard about but never ate at before. Happy hour starts when they open and ends when they close and the food was great also. 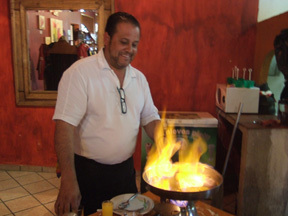 Here Pepé, the owner and chef, is preparing a crepe--flambeau style. It was as much fun to watch him make it as it was delicious to eat. 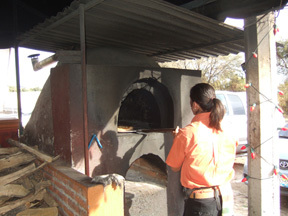 Another one of his unique cooking devices is this wood burning oven used primarily for making pizzas--and what great pizzas they make. 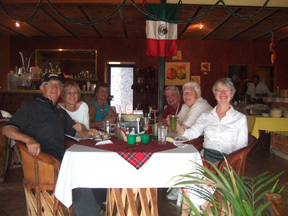 We enjoyed Pepé's so much, we decided to move our traditional Friday night social at their restaurant. 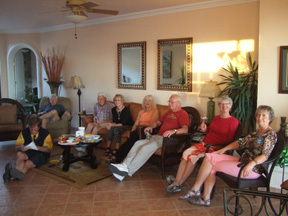 Nearly 30 people showed up this first time and has become one of our favorite Friday night hangouts. 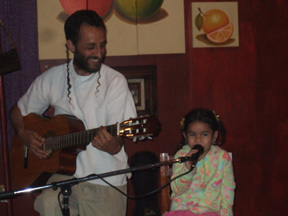 Wayne and Maureen, Glorine's sister, brought their four-year old God daughter to this Friday evening event and before we knew it, she joined David, on guitar, singing one of her favorite tunes. She was the star of the show! Super Bowl is a big event here and many of the expats host Super Bowl parties. 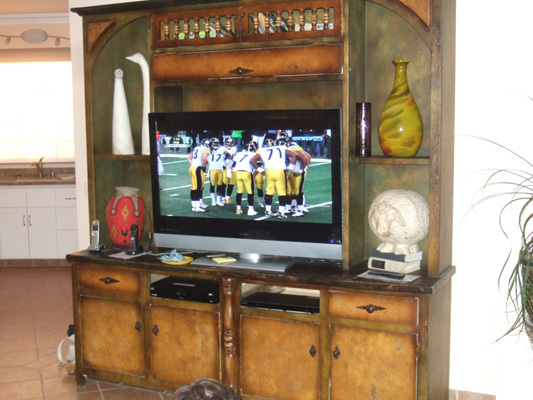 We got to watch it on this 52" flat panel TV, which had great picture quality and color. Here is the stadium. 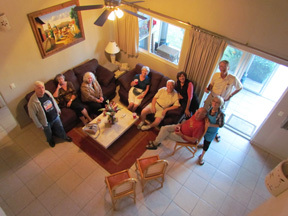 Jean, on the right, and her husband Doug, third from the right, were our hosts. They are from Central Oregon and winter here every other year or so. They have a beautiful rental in the foothills. The hamburgers, along with everything else they made were a big hit during half time. While we only have a 32" flat panel TV, it still makes for great movie nights. Over the course of our time in Ajijic this season, we hosted three movie nights, with four to five couples at each. This event includes pool/hot tub time and a great "Glorine" meal, before watching a "first run" movie. 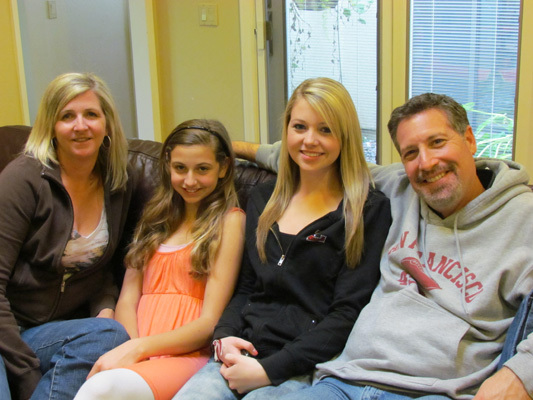 In mid-February, we flew to California to spend ten days with Carmen and family. 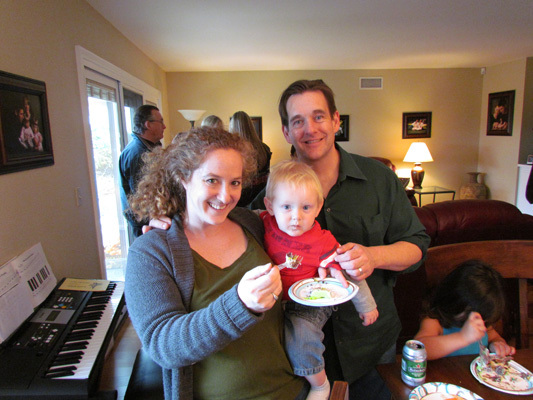 Denise and her family flew in from Minnesota to take a break from a harsh winter and to help celebrate Hunter's first birthday. Think these two look alike? Valentines day was a special treat. 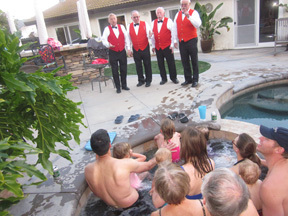 First we were invited over to Steve and Kathy's home for a Valentine's dinner and thanks to Mike we were treated to a surprise visit with music from this barber shop quartet. What a memorable moment that was! It was a school week for Dakota and Papá Larry got to take her to school. She was in her 100th day of kindergarten during the week we were there. 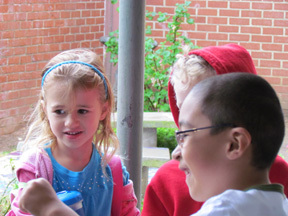 She loves everything about school, including her classmates, teacher and homework. 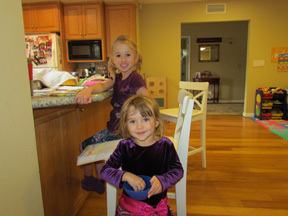 Here is a snap shot of Sierra and Dakota, while she was at the nook doing her homework. One of her assignments was to ask Nana and Papá what they liked so much about Mexico. She wrote our remarks out in a complete sentence. We are amazed at what they can do at this early age. 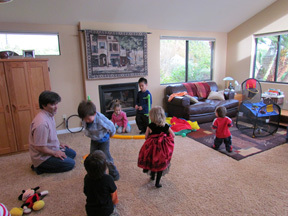 Hunter's birthday arrived and what a party it was. The cake had to be one of the most elaborate decorations we have ever seen. 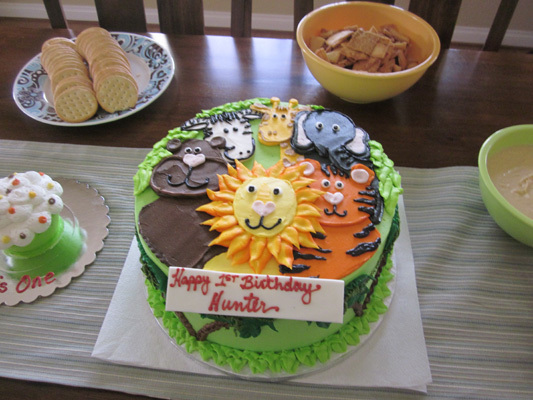 Plus the cake to the left was just for Hunter. Yes, he loved it. Hunter is a very happy little boy and has a great big infectious smile--he takes after his sisters. The kid's birthdays are a mix of the most eclectic group of people we have ever known. All with children of their own, mostly the ages of Carmen's kids. The sunroom was a hit for the kids to run around and play games. 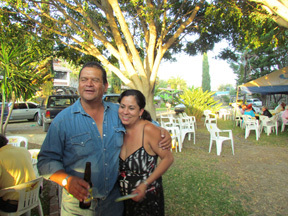 Our friends, Phil and Mary, from Ajijic have a daughter who also lives in Fullerton. 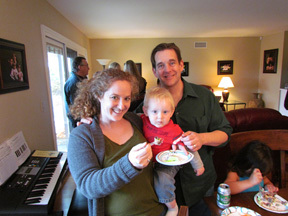 This is Elizabeth and Kyle, with their baby Jimmy. Elizabeth teaches at Cal State-Fullerton and lives a few miles from Carmen's. Being in the states, we brought and returned items for friends, including items for Phil and Mary. 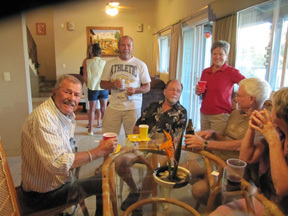 The party was a great way to get the stuff for Phil and Mary, plus an opportunity for them to join in on the birthday party. Here is Cathy and Steve with their daughters, Vickie and Stephanie. Steve works with Mike. 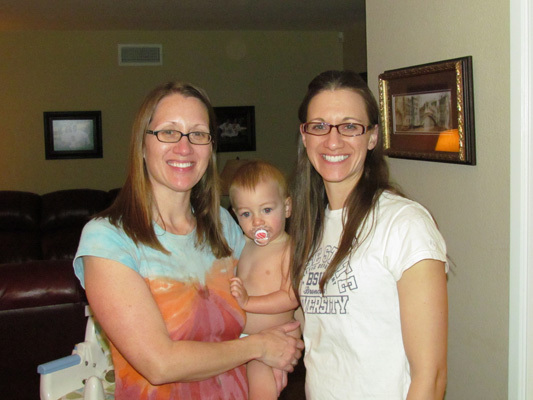 Cathy works with Carmen and have known one another since Carmen was doing her post doctorate work in the mid-1990s. They are the ones who graciously opened their house and hot tub for our family reunion. After a wonderful ten days in Fullerton, California we are now back in Ajijic through the end of March. Rather than hosting a large farewell party like we did last year, we decided on a couple of smaller parties. Here we are at El Parque enjoying a warm afternoon at the pool and hot tub. After another great meal of chicken	lasagna along with white chili chicken, we split up into three teams and played a dice game called 6-5-4. It is a game we used to play at most of the Ressler get	together back in North Dakota. Another fun evening. Each Sunday we attend Open Circle, organized by a group who host different speakers that focus on topics near and dear to their hearts. 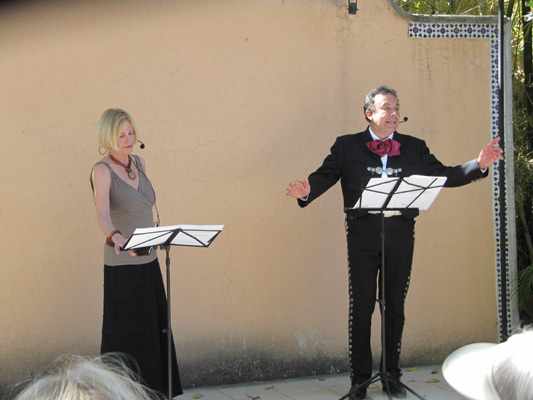 This week highlighted Margaret Van Every reading poems from her book "A Pillow Stuffed with Diamonds" where she writes about Mexico in general and Ajijic more specifically. Rubén Varela, a local restaurant owner, repeated each of the lyrics in Spanish. Made for an enjoyable and entertaining morning. A traditional party that has been going on for years here in Ajijic (but our first time) is one thrown by the "kissing cop." If he stops a car, you will get a kiss from him if you are a female and hopefully not a ticket. All you bring to his party is an unmarked envelop with some dineros (we get to decide how much). And in return, we get a meal fit for a king and all the booze you want to drink. 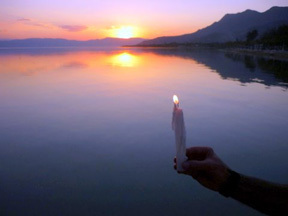 End of life is a topic we rarely discuss but when we lose someone, it becomes time to reflect on our own immortality. Jim Collums, a person we knew, but not well, died while we were in California. When we returned, his friends and family had a memorial for him at a local nightclub, which included a "no host bar" while people were sharing their special memories of him. This was followed by an hour of music and dancing, then followed by a short candle light procession along the shoreline to the pier, where Jim's ashes were spread in the waters of Lake Chapala. It was the most upbeat celebrations of one's life we have ever witnessed.